A guy that I went to school with just launched a pretty awesome website called anywhere.fm. It's funny that I heard about this yesterday, because 2 days ago I was telling a friend that I could NOT think of a website that I would use that I didn't already have. 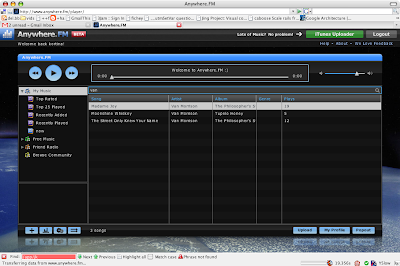 anywhere.fm turned out to be pretty great and I plan on using it. Basically, it's a flex version of itunes that runs in your browser. It's free, and you can upload as much music as you want to your account and then stream it anywhere by just logging into the site. 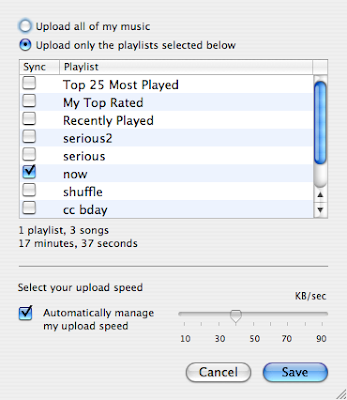 They also have a bulk uploader you can install on OS X or Windows in case you want to upload a lot of music.